The third and final steam generator has been put in place at unit 5 of the Hongyanhe nuclear power plant in China's Liaoning province. The ACPR-1000 reactor is scheduled to begin operating in late 2019. Steam generators are used in pressurised water reactors to transfer heat from the reactor coolant into water in a secondary circuit, producing the steam used to power the electricity-generating turbines. Each steam generator contains thousands of kilometres of tubes through which hot water flows. The final steam generator - almost 21 meters in height and weighing more than 300 tonnes - was hoisted into place on its vertical support within the reactor building of Hongyanhe 5 on 10 June, China Nuclear Industry 23 Construction Company Limited (CNI23) has announced. The first two steam generators were installed on 3 May and 24 May, respectively. CNI23 said installation of the steam generators has "laid a solid foundation for the subsequent start of the main pipeline welding work". 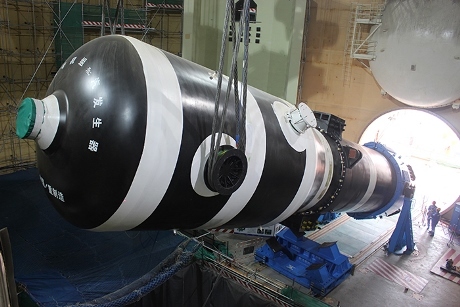 Installation of the steam generators followed that of the reactor pressure vessel on 30 March. Construction of Phase I of the plant, comprising four CPR-1000 pressurised water reactors, began in August 2009. Units 1 and 2 have been in commercial operation since June 2013 and May 2014, respectively, while unit 3 entered commercial operation in August 2015 and unit 4 in September 2016. Unit 5 is the first of two 1080 MWe China General Nuclear (CGN) designed ACPR-1000 reactors that will form Phase II of the Hongyanhe plant. Construction of unit 5 began in March 2015 and that of unit 6 starting in July the same year. The second phase of the Hongyanhe plant is planned to be completed in 2021. It is owned and operated by Liaoning Hongyanhe Nuclear Power Co, a joint venture between CGN and State Power Investment Corporation, each holding a 45% stake, with the Dalian Municipal Construction Investment Co holding the remaining 10%.